Where can you find Megascops kennicottii? M. kennicottii (western screech-owl) can be found in a wide array of places including deserts, forested, and temperate climates (Rodriguez-Estrella and Palaez Careaga 2003; BirdWeb 2014). 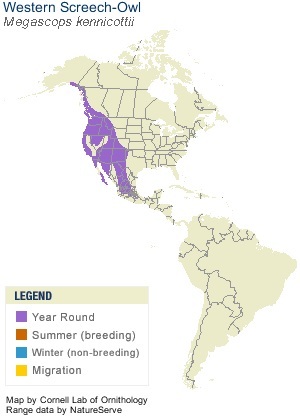 In fact, the western screech-owl inhabits a large span of northern America reaching from western Alaska along the peninsula of Mexico, also known as Baja California (Rodriguez-Estrella and Palaez Careaga 2003). Despite the immense area of residency, M. kennicottii is a non-migratory species and thus typically dwelling in the same nest year round (Herting and Beltoff 2001; Rodriguez-Estrella and Palaez Careaga 2003). There are known and studied populations of M. kennicottii along the western side of the Rocky Mountains, southwest Idaho (Ellsworth and Belthoff 1999), and along Baja California (Rodriguez-Estrella and Palaez Careaga 2003). However, the western screech-owl doesn’t live in any environment. In fact, populations of the owl are rather scarce in urban locations because the lack of nest discovery in tree cavities (Ellsworth and Belthoff 1999; Rodriguez-Estrella and Palaez Careaga 2003). In addition, the western screech-owl is not found in dense forested locations (BirdWeb 2014). M. kennicottii avoids the urban and compact forests by residing along the edge of forests that are open to fields (Rodriguez-Estrella and Palaez Careaga 2003) or along small waterways, such as creeks (BirdWeb 2014). The western screech-owl finds its homes primarily in preexisting tree cavities in trees such as cottonwood and maple (BirdWeb 2014). However, there are plenty of trees that serve as a perfect home to raise a family including, but not limited to, willows, box elders, Russian olives, and black locusts (Ellsworth and Belthoff 1999). The tree cavities need to be about 12 inches big for the Western Screech-owl to consider claiming it as their home (Molina 2010). The owls rely on an “as is” condition and do not build any structures to protect itself and their offspring (All About Birds 2014; Rodriguez-Estrella and Palaez Careaga 2003). Thus the bare tree cavity essentially functions as the nest. To see a short video clip of a Western Screech Owl finding a tree cavity, click this link. You will see the animal finding a cavity and then calling out to their mate. In addition, western screech-owls often take advantage of nesting boxes that are placed by humans to counter deforestation effects on population in suburban areas (Rodriguez-Estrella and Palaez Careaga 2003; All About Birds 2014). Throughout its residence, the bird maintains its territory by a series of calls that are described in the Life History section of this website. Go back to the homepage or continue to read about the form and function of the Western Screech Owl.